George Groves is an English professional boxer. 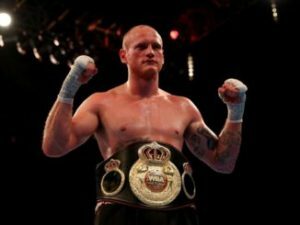 He held the WBA super-middleweight title from 2017 to 2018, and previously the European, Commonwealth, and British super-middleweight titles between 2010 and 2014. He won the ABA middleweight title twice in 2007 and 2008 as an amateur. Born on March 26, 1988 in Hammersmith, London, United Kingdom, into a working-class (middle-class) family, he is the son of Yvonne and Donny Groves, an amature boxer. He attended Sheen International, a local comprehensive school in London. On 15 November 2008, he turned professional and joined the Hayemaker Promotions stable. He has been married to Sophie Groves since 2010. *He was born on March 26, 1988 in Hammersmith, London, United Kingdom. *His father was also an amature boxer. *He recorded victories in his first 19 professional fights.